Production of worsted (long fibre) yarns for weaving is expensive, due to the necessity to two-fold, or ply together two singles yarns, to create yarns that survive the stresses of weaving. Typical singles yarns break too easily during weaving. Solospun® is a spinning technology which provides the means to produce a singles yarn that can be successfully woven. The technology is a versatile and cost effective alternative to traditional means of producing weaving yarns. The Solospun® technology is a simple, inexpensive, clip-on attachment to standard long-staple spinning frames that produces robust, single-ply worsted yarns that withstand the stresses of weaving. The Solospun® hardware consists of a pair of rollers held in a bracket, which is clipped onto a spinning frame. Each roller is positioned where it interacts with the emerging drafted fibre strand before twist insertion. The roller-fibre interaction subtly changes the structure of the yarn, which dramatically increases its abrasion resistance. Compared with two-fold yarn production, spinning costs and processing times are dramatically reduced, efficiency is improved and there are no twisting costs. The technology was the result of a joint development between CSIRO Textile and Fibre Technology, the Woolmark Company and the Wool Research Organisation of New Zealand (WRONZ). It was commercially released in 1998 and is now successfully operating in worsted mills worldwide. Solospun® technology has been installed by spinners in many countries, including: Australia, China, India, Japan, Korea, Mexico, Spain, Thailand, Turkey and the USA. Spinning is the conversion of fibre or filaments into a continuous strand by the insertion of twist. If you have ever observed a hand spinner, you will have noted that the fibres are gradually teased out between the thumb and forefinger of one hand from a bulk fibre supply held in the other hand. In order to hold the teased out fibres together to make something useful out of the fibre assembly, the fibres are twisted together by the rotating action of a spinning wheel or some other rotating device, hence the term spinning. Historically, this was performed by women referred to as spinsters. With the introduction of fully mechanised spinning during the 18th century the process became more complex. In order for the spinning machines to tease out the fibres (referred to as drafting) before twist insertion to produce a uniform yarn, steps to prepare the fibres prior to spinning became necessary. In the worsted spinning industry, these steps are referred to as drawing, and are designed to draw the heavy fibre assembly down gradually to produce a fine, uniform worsted yarn. Depending on the quality of the fibre and the fineness of the yarn to be spun, drawing may consist of three or four steps. An intermediate step is also required between drawing and spinning and the product after this step is known as roving. Roving is a lightweight but cohesive continuous assembly of fibres that is introduced to the spinning frame for drafting and twisting to form a yarn. Its cohesion is provided by either very low twist or by rubbing, which slightly entangles the outer fibres. Ring-spinning remains the dominant form of spinning used for wool, primarily because it is seen to produce a superior yarn to other spinning systems. Traditionally for weaving, two single ring-spun yarns are twisted together to form a two-fold, or a two-ply yarn. Twisting together to produce the two-fold yarns binds the surface fibres of the singles yarns into the twisted structure so that it is smoother and more resistant to abrasion during weaving. Dieter Plate and colleagues from the CSIRO Textile and Fibre Technology developed the Sirospun system which in essence is the combination of spinning and two-folding in a single step on the spinning machine. Sirospun uses the torque/friction forces involved during twist insertion to bind two drafted roving strands together initially, and then applies further twist to the two-fold structure in the conventional ring-spinning manner. Sirospun was formally released in 1980. The earliest version of Sirospun involved the introduction of an additional roller just below the point of conversion of the two strands. This roller had a recess around part of its circumference, allowing the intermittent propagation of twist from the revolving spindle/bobbin along the two converging strands. The periodic variations in the twist enabled the binding together of the strands into a structure suitable for weaving. An elegant feature of the design was that if one strand broke, the other strand would be pulled out of the recessed section of the roller and also broken. If one strand had continued to be spun then a yarn of half the required thickness would have been spun in error. A simplified procedure was then developed, but this needed a device to break out the remaining strand if one of the strands should be accidentally broken. A simple, effective break-out device was developed that acted as a twist block when pulled off centre by the remaining strand so breaking it. Sirospun is especially suited to the production of light-weight, trans-seasonal ‘Cool Wool’ fabrics and was promoted by The Woolmark Company for this purpose. The Woolmark Company promoted Cool Wool as a light weight worsted fabric with a soft or dry handle, supple drape, clean finish and ‘hard’ twist yarns ideal for a wide range of climates and temperatures. Sirospun has two major advantages, the cost of two-folding is eliminated, and the productivity per spindle on the spinning frame is effectively doubled. Without the experience gained in the development of the earlier weavable singles yarn development Sirospun, the current Solospun technology may not have eventuated. When spinning a singles yarn, one strand of roving is used to spin one yarn. In order to reduce the yarn hairiness for weaving, two singles yarns are spun with the resulting structure trapping the protruding fibre ends within the resulting two-fold yarn. Sirospun worked on the principle that when two strands of wool fibre, separated by a set distance during the drafting stage in spinning, were allowed to combine in the twisting zone, fibre ends were naturally trapped within the resulting yarn, creating a yarn with low yarn hairiness suitable for weaving directly from the spinning frame. For the same fibre diameter, Sirospun technology allowed the production of weaving yarns that were lighter than could economically spun using the conventional singles and two-fold yarn route. Although quite successful, and still used today, Sirospun requires twice as many roving packages on the spinning frame, special roving guides for the drafting zone and a detector to break the yarn if for some reason only a single fibre strand was spinning. The demand for even lighter weight fabrics continued, so the challenge was to produce an even lighter weight weavable singles yarn on the spinning frame. Would it be possible to produce a weavable singles yarn from a single roving? A lot of discussion among colleagues ensued to ponder the problem and likely solution. While playing with ways to ‘mop up’ the outer fibres in the drafted fibre strand so that they might be incorporated within the yarn structure using a small roller placed at the exit of the draft zone, Martin Prins observed that the emerging strand split into two when half the fibres ‘fell’ over the edge of the roller. The fibre strand that remained on the surface of the roller and the strand that was moving down the side of the roller recombined and were twisted together to form a yarn – Sirospun in miniature. The part of the fibre strand that moved down the side of the roller was susceptible to breakage, so Martin designed various rollers aimed at splitting the strand in two, including a range of cam-type profiles. A yarn from a single roving having low yarn hairiness could be produced. However, this design relied on the splitting roller to be always accurately aligned with roving strand – not possible under commercial spinning conditions. In order to minimise wear on the rubber draft rollers, the rovings are slowly traversed from side-to-side. So how do we maintain alignment under these conditions? Martin’s solution was to design a roller with fine slots across its width so that no matter where the roving was in its back and forth traverse, it would always be split into two or more strands. Once the principle was established, the technology had to be implemented. The Solospun® rollers were best driven from the bottom front metal rollers, but rubber was not a suitable material as it was difficult to manufacture with slots and tended to wear down very quickly. Metal or hard wearing plastic tended to slip and when fitted with a rubber tyre it attracted fibre and required constant cleaning. A compromise with plastic hardness was the best solution and the addition of carbon prevented static charge build up and so minimised fibres adhering to the roller. Using the knowledge and experience of plastics experts was invaluable at this stage. Finally, the work of many resulted in a simple attachment mechanism which eliminated the need to make any modifications to the spinning frame, resulting in a simple clip-on attachment to standard long-staple (worsted) spinning frames to produce weavable singles yarns – Solospun®. The development of Solospun® was greatly facilitated by the experience gained during the development and implementation of the previous Sirospun spinning technology. Making the connection with the in-miniature strand splitting created by the small roller placed at the exit of the drafting zone on the spinning frame and Sirospun was the key. As shown in the figure below, the hardware consists of a bracket that holds a friction pad and a pair of Solospun® rollers. The bracket clips on to the shaft of each pair of top front output rollers of the spinning frame, with each Solospun® roller being positioned just below and parallel to, but not in contact with, its corresponding top front output roller. The Solospun® rollers are rotated by being in contact with the bottom front output rollers. Unlike Sirospun, Solospun® is spun from a single roving strand, therefore there is no longer a need for a double roving creel or breakout devices. Commercialisation was fairly straight forward with two of the project partners, WRONZ and The Woolmark Company, marketing the technology, with the rollers and clip-on attachments being manufactured in Australia by Warren & Brown in Melbourne. During 1998 Solospun®, was released and subsequently displayed at the 1999 Paris ITMA Exhibition. This technology is based on an initial clip-on, roller attachment developed at CSIRO. As the name suggests, Solospun® is a spinning technology that produces a weavable singles yarn in a single step from a single roving. As illustrated in the figure below, the Solospun roller’s operation is to interrupt the path of the drafted fibre strand, nipping it against the bottom front output roller. 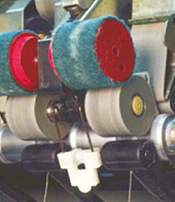 The surface of the Solospun® rollers is made up of four segments. As shown in the sequence in the figure, a ‘land’, which is flush with the roller surface and runs parallel to the roller axis, separates each segment. Between each land is a series of slots that are offset in each adjacent segment. The Solospun® rollers act as intermittent twist blocks, preventing twist from reaching the fibres emerging from the front output roller nip. The slots in the Solospun® rollers divide the drafted fibre strand into a number of sub-strands as shown, which, through the intermittent twist-blocking action of the roller lands, converge at varied angles and rates to achieve a subtly entangled structure with locally differing twist levels. The figure above illustrates how the varied angles and rates are achieved in one-quarter turn of the roller. Following the sequence from left to right, new sub-strands are formed after the main, drafted fibre strand has been nipped by one of the roller lands. As the land rotates away from the nip point, the sub-strands move down into the slots. As this occurs, the angles between the sub-strands increase. The continuing changes in these angles result in increased fibre migration and fibre trapping. When the next land reaches the nipping point, a new set of sub-strands is formed in the offset slots of the following quarter segment. This process is repeated every quarter turn, so that, depending on their length, fibres may undergo many changes in sub-strand position during twisting into the yarn. This action confers greater fibre security as fibres are trapped by neighbouring strands and by migration within and between strands. Consequently, in comparison to equivalent singles yarns, Solospun® yarns have fewer protruding fibre ends per unit length and increased abrasion resistance, making them weavable without the need for two-folding or weaving assists such as size, typically used in the cotton sector and increasingly used in the worsted sector. Prins MW, 2010, Personal communication.